January, if I may be so bold to declare, is a month that should have never been invented. It’s the first month of ‘real’ winter, and though technically the days are starting to lengthen, you’d never know it by the weak, anemic rays given off by a sun that collapses back into bed a few short hours after rising. There is not much solace to be found on the home front either, as the new year dawns not with plans for enjoying life more but with the promise of penance for all our holiday sins. Gone are the cups of spiked eggnog and the plates of crumbly cookies, the roasts and gratins and copious amounts of good wine – they’ve all been replaced by resolutions to put that gym membership to use and to ingest considerably less of everything. In my case, there’s yet another contender for most unpleasant addition to the resolutions list, a particularly sharp thorn in my side that refuses to be ignored: my long-neglected, fast-approaching-deadline doctoral dissertation. I’ve resigned myself to the fact that it just needs to get done, no matter how painful the process. The problem is that in order to muster up the strength to do it – and no matter what the January health police are telling us – a girl just needs some edible comfort. I’d bet that for the majority of us, our comfort food lists share some remarkable similarities: cheese, potatoes, bread, chocolate. High-fat, high-carb foods comfort us at a biological level – in times when we couldn’t run down to the supermarket for a loin of venison but instead had to find a deer and kill it, foods that promoted fat storage often meant the difference between surviving and not. Unfortunately biology is a little slow to catch up with the overfed realities of the modern world, and since calories are not a precious commodity anymore I certainly would rather be craving a head of broccoli than a plate of fettuccine. Then again, the fact that I don’t could be down to more than just biology – after all, since we don’t always allow ourselves that plate of fettuccine, psychologically it takes on increased allure. You know how we always seem to want what we can’t have? Well, perhaps these foods are just so darn appealing because of their rarity in our lives. If that’s the case, I’m more than happy to hold back most of the time in order to keep my comfort foods firmly on their lofty pedestal. Among all my comfort foods, Flammekueche ranks pretty near the top. It’s a specialty of Alsace, the region straddling France and Germany geographically, historically and culturally that without a doubt has perfected the comfort-food formula better than any in Europe, in my opinion. Think German heartiness and bold flavors tempered with French finesse and dedication to quality, and you have Alsatian cooking. Flammekueche, whose name means ‘flame cake’ in the Alsatian dialect of German (and is known as Tarte Flambée in French) feeds my primal need for cream, meat and starch. It appears in many permutations, sometimes built on puff pastry, sometimes on delicate shortcrust, sometimes with the emphasis on onions and eggs instead of bacon. They’re all delicious, but the version I prefer is what I believe is most true to its roots as hearty peasant fare baked over an open fire. 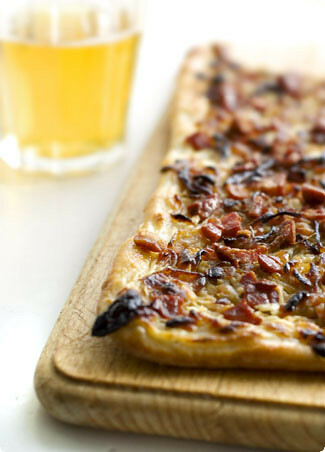 It starts with a bread-dough crust, not dissimilar to pizza, which had been stretched paper-thin and topped with a perfect trinity of wintertime staples: a smear of creamy fromage blanc (or crème fraîche, if you prefer), nests of molassey caramelized onions, and as many crispy batons of smoked bacon as you can fit. You slide it into a ferociously hot oven and watch it transform before your eyes, bubbling and blistering and sizzling into something beautiful – rustic, hearty, delicious, soul-satisfying. And believe me, there’s simply nothing better for a frigid January evening, whether you’re chained to the computer like me, fresh in from making good on your gym membership, or sitting by the fireside polishing off the last of those holiday cookies. Notes: Feel free to use your own favorite pizza crust for this, whether homemade or store-bought. The crust recipe I’ve given comes from master baker Peter Reinhart and his homage to pizza, American Pie. It’s one of the easiest doughs to work with and gains incredible flavor from its long, slow rise – however, if you’re strapped for time, a rise at room temperature will work just as well. For the crust, combine all of the ingredients in a large mixing bowl and stir vigorously with a wooden spoon or mix in a stand mixer. After everything has come together, set the dough aside to rest for 5 minutes. Stir again for 3 to 5 minutes, adding more water or flour if necessary. Generally speaking, you want the dough to be wetter and stickier than your typical bread dough. It should be dry enough that it holds together and pulls away from the side of the bowl when you mix it, but it doesn’t need to be dry enough to knead by hand. Divide the dough into 2 pieces. Place each one into an oiled freezer bag. At this point the dough can be frozen for up to a month. If you intend to bake them later that day, place the bagged dough balls in the refrigerator and let rise slowly for several hours (five to six is a good estimate, longer is fine too). Remove them from the fridge and let them warm to room temperature an hour or two before you intend to bake them. For the topping, stir together the fromage blanc or crème fraîche with some salt, pepper and nutmeg (be careful not to oversalt, though, as the bacon will be quite salty). Melt the butter in a heavy pan or skillet over medium-low heat and toss in the onions. Cook slowly, uncovered, until the onions are uniformly deep golden in color, adding a spoonful of water if they ever look like they’re starting to stick and burn. This should take at least half an hour. Near the end of the cooking time, sprinkle in a couple pinches of salt and the tablespoon of sugar. Remove from the heat and transfer to a bowl. Wipe out the skillet and return to medium-high heat. Toss in the bacon pieces and fry, stirring occasionally, until they are crispy and browned in places. Remove to a plate. led-out portion of the dough to a baking sheet and stretch it with your fingertips to cover the entire surface. Be careful not to tear the dough. Repeat this process with the second portion of the dough, again carefully stretching it to fit the other pan. Cover each portion of dough with a thin layer of the fromage blanc (about 1/4-inch thick – you may have some left over), half the caramelized onions, and half the crispy bacon. Immediately transfer to the oven and bake for about 15 minutes, or until browned and sizzling. Cut into rectangles and serve hot. You’re so right – it’s ridiculous how ascetic January is after the decadence of December. But resolutions be damned – this is one fine-looking recipe. The bread dough, in particular, looks like something to save. Thanks for the inspiration! Melissa,While the tart may not be good for the hips, it looks like it’s pure bliss for the heart and stomach … the two most important parts of the human body!Enjoy! Flames they may be, but what fragrant flames!Bon appetit! Can’t you explain to your professor that you have a blog? And that’s why you don’t have time for your doctoral dissertation..
Hi Melissa – thank god I only discovered the foodblogs after I had got my PhD – it was enough of a struggle without this extra distraction, so I totally understand you:) Your Alsatian onion tart looks delicious – I’ve had a pleasure of eating it in Alsace a few years ago, so you’ve just brought back some lovely memories. Hiya,You can’t imagine just how much I grumble at S when she’s procrastinating on finishing her PHD thesis. She’s promised to finish it this month but I think it will be at least June before that happens. I have promised to take her to one of our fanciest restaurants here when she does finish, so hopefully that will motivate her a tad ;-)Gorgeous photo as always. I love Alsatian onion tarts. I’m sure glad I finished my thesis before I even discovered that food blogs existed! Had Flammekueche when we were in Strasbourg just a few weeks ago for the first time – YUM. Thanks for sharing the recipe. My husband is going to be over the moon when I surprise him with it! Sister, I hear you on the graduate school woes! For the first year of Orangette’s existence, I struggled through the same thing, although mine was only a Master’s degree. Something tells me, though, that with the proper fuel – i.e. plenty of bacon, butter, fromage blanc, and good, melty onions – you’ll be finished before you know it. Cheers to that, and many thanks for reminding me of my love for these Alsation beauties. It seems we’re all going through a post-holiday culinary revolt – turning to our comfort foods for shelter from the eeevil January. What a great combination of flavors, truly warming and cheery against that grey excuse for sunshine! All I can say is, your lovely site makes me want to learn to cook, very inspiring. I recently began reading your blog, and am enjoying it very much…the recipes, writing, and design are wonderfully appealing-I can see why you were nominated in so many categories!I like the idea of this tart with a bread/pizza dough. I think I will try the topping with my favorite thin crust, hot oven pizza dough. I usually make it with thinly sliced potatoes, onions, and rosemary-it’s from maggie glezar’s Artisan Baking. Me too – this is a recipe that I’m going to try soon. I just wonder…how do you do all of this and work on your dissertation? I’m very impressed! Hey Melissa!.. Gewd luck with the your dissertation. Don’t burn off your eyes from too much PC though. Hehe..Oreo has always been my comfort food but since I’m supposed to be going for something healthy, I’ll just say it’s salmon. Salmon. And yeah, fireside eating is always sweet. Now, I’m going to whip up myself a nice batch of resolutions. 🙂 Nice post!! Melissa: Ah, the hell with New Year’s resolutions and ideas of eating nothing but green vegetables. It’s January. Here in Seattle, it is raining for the 27th day in a row. And not just drizzly rain, the way we normally have, but hard, cold rain that falls on the head and hurts. Baking is the answer. I’m working on a gluten-free gingerbread as I write, and I made up some gluten-free fig newtons earlier this week, which I posted on Monday. I’m all for the baked goods right now. We deserve them. By the way, what flour did you use for this? You wouldn’t have used wheat, right? Which of the gluten-free ones best work for this pizza crust? That’s another one I’ve been working on lately…. Thanks for clearing that up for me Melissa! A chef was presenting this dish on tv recently and I thought he called it "Pflaumenkuechen". I was only half listening, but I sat up straight as that didn’t look like any plumcake I’d ever seen! Now I know that he got it right and I was wrong! What a delicious recipe and mouthwatering photo!